In a former “lifetime” working for the Department of Defense in the Pentagon, I was assigned to an office responsible for the preparation of the annual Army Intelligence budget and the accompanying Congressional justification process. After several months, I was able to wade reasonably well through the various ‘dark rooms’ and obscure passageways of a very voluminous series of documents and complicated accounts, made even more opaque due to any number of security classifications that limited individual access and public disclosure. When I ended my ‘two year penance’ in this environment, I vowed I would never again tread these mysterious budgetary corridors and that clarity would remain a guiding principal in whatever budget venture I found myself. But then I came to the County of Hawaii, where clarity sometimes is a daily occurrence and politics adds another measure of vagueness. Why then should I be surprised to learn that the administration argued against each of the three resolutions on the table? The first proposal presented by Ms. Ford encouraged the administration to develop a retirement incentive plan for certain County employees as a method to possibly reduce future costs; emphasis please on the word ‘encourage’. This apparently was too strong a suggestion for the County, as Finance Director, Nancy Crawford ‘discouraged’ any pro-active measures in this direction. We moved on to a proposal by Mr. Yagong to immediately implement a zero-hiring policy for the reminder of this fiscal year, i.e. until 30 June 2010. Once again, this was considered too tough, even though I think the Mayor has stated several times that he isn’t filling those vacant positions, and the administration knows full well that if a sudden emergency occurred, the Council could quickly take action to make whatever exception might be required. Finally, Mr Yagong suggested that the Mayor transfer the allocations in the vacant funded positions to the Budget Stabilization Fund, thereby insuring that some funds would be set aside to cover 2010-2011 shortfalls. That also apparently was too much for our administration, as our Finance Director told us that the administration has yet to issue a statement of Fiscal Emergency. Say what?? Didn’t we just list above the specific funding difficulties articulated by the Mayor and the administration? Didn’t he indicate that the budget might well be reduced by some $70M? Isn’t the threat of furloughs/lay-offs a ‘real’ emergency for many families? Unless there’s something here I can’t interpret, this all seems pretty severe. If this isn’t a fiscal emergency, I wonder what is? To add to the mystery, we have the deepening puzzle of the fund balance for June 2009. That figure has been delayed, lost, or otherwise unknown for public consumption. (Dare I mention that ‘evil’ concept of transparency at this point!!) Normally we know the fund balance for the previous fiscal year by 1 November. This year it remains a mystery. Indeed, the Finance Director has told me the administration can’t even estimate what that figure is at the moment. Remember, we must have that figure to tell us what our shortfall is for this fiscal year and to properly estimate the budget for 2010-2011. So the plot thickens. We think we are in a budget crisis. However, the administration argues against even limited suggestions for fiscal constraint from the Council. The Mayor, I thought, very correctly, voiced serious concerns for the economic health of the County in the coming fiscal year. However, no financial emergency has yet been declared by the finance folks. Tax collections are down we were recently informed in Council and an ad-hoc Committee formed to assist in discovering reasonable solutions to a full range of budget issues. But this administration doesn’t yet know (or won’t tell) what the previous year’s figures might be and won’t even venture an estimate of our situation. While I may disagree with some of the issues advocated by the administration, I have never felt that our finance department is incapable of providing basic information. These are smart people and we are fortunate to have them working for the County. So I ask what could possibly be the reason for being unable to calculate a critical element in the previous year’s budget, six months after the close of that fiscal year? Are we in a budget crisis or not? The Pentagon was somewhat murky, but Hilo is fast approaching intense darkness. I am reminded of the line the King of Siam intones in the Broadway play the “King and I”; sometimes life is a ‘puzzlement’. 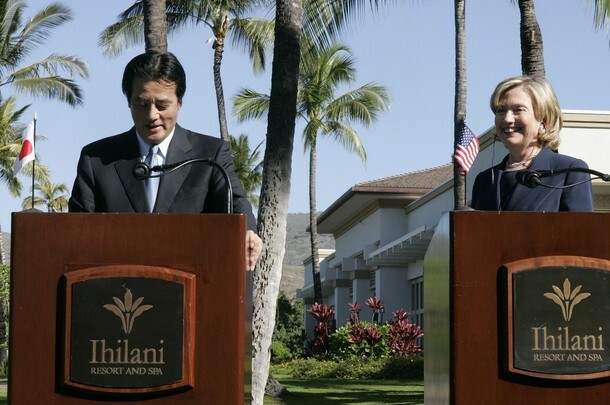 SECRETARY CLINTON: Well, welcome to this incredibly beautiful day here in Hawaii, and it’s a great pleasure to welcome the foreign minister here. These beautiful islands are the birthplace of President Obama and they serve as a reminder that the United States is a Pacific nation that shares the challenges and the opportunities of our partners around the Asia-Pacific rim. As the President said in Tokyo in November, we are not separated by this great ocean; we are bound by it. In this first year of the Obama Administration, we have renewed American engagement and leadership in Asia and the Pacific. The President and I have worked bilaterally and multilaterally to ensure that the United States is not only back, but here to stay. By the end of this week, I will have made four trips to the region and touched every corner from Northeast Asia to Southeast Asia, from China and India to the Pacific islands, Australia, and New Zealand. And it was my great honor to visit Japan on my first official trip as Secretary of State, a testament to the enduring importance of our relationship. The alliance between the United States and Japan is a cornerstone of America’s engagement in the region and an essential pillar of the Asia-Pacific security architecture. It continues to underwrite regional stability and prosperity and enhances our own national security as well. This is not a pact directed against any adversary. It is a partnership that supports our shared interests and values and is rooted in our common commitment to democracy, the rule of law, and universal human rights. In the past year, both the United States and Japan have sworn in newly-elected governments, a democratic ritual we sometimes take for granted but that is still too uncommon in too many parts of the world. Our democratic values give the Japanese and the American people the strength, resilience, and flexibility to meet the challenges of a changing world. This month – in fact, next week, one week from today – we are celebrating the 50th anniversary of the signing of the treaty that has provided our alliance’s unshakable foundation. And it is an opportunity to mark the progress we have achieved together for our people and for the people of the region and the world. Fifty years ago, President Eisenhower affirmed what he called our indestructible partnership, and it has proven to be dynamic as well as durable. The passing decades have brought new challenges and new opportunities, but through it all, the alliance between the United States and Japan has been the bedrock for regional peace and prosperity. So today, we know that this partnership is not just indestructible; it is truly indispensible. Our alliance has helped the United States and Japan become the world’s two largest economies, with Japan becoming America’s second-largest trading partner outside of North America. Our innovators and our entrepreneurs collaborate every day to produce cutting-edge technologies and spur growth on both sides of the Pacific. Our students and educators learn from one another through exchanges and visits. Our doctors and scientists work together to advance the health of both our people and our planet. These bonds of commerce and culture bind us together. And they will only grow stronger, thanks to the recent Open Skies Agreement which will make it easier for both business travelers and tourists to fly between the United States and Japan. Our partnership depends on close cooperation, coordination, and consultation, and I look forward to working with Minister Okada to ensure that the next 50 years of our alliance are as fruitful as the last. We are working together to meet the challenges of the 21st century. From reconstruction efforts in Iraq, to combating piracy off the Horn of Africa, to significant economic assistance to Afghanistan, Japan is providing crucial contributions to global security and stability. Japan’s Self-Defense Forces have donned blue helmets to promote peace in troubled lands, and Japanese development programs have helped millions of people from Sub-Saharan Africa to Southeast Asia break free from the chains of poverty and take control of their own destinies. Bilaterally and through multilateral organizations such as the G-20, APEC, and others, the United States and Japan have worked to respond to the global financial crisis to start rebuilding the world economy and put in place necessary financial reforms. And last month in Copenhagen, the United States and Japan joined together with other partners to reach an agreement that represents a meaningful step forward in the global commitment to combat climate change. Now we have to work to operationalize the accord and to put in effect all of the effective ideas for us to combat this global challenge. Through our partnership, the United States and Japan seek to ensure that Asia’s evolving multilateral organizations are inclusive, transparent, and solutions-oriented. A strong U.S.-Japan alliance is not only consistent with robust Asia-Pacific multilateralism; it is crucial to its success. For decades, our security guarantees have provided the stability needed to grow the region’s economies and diplomatic structures, and we are committed to building a strong foundation for the 21st century. We continue to work together for a nuclear-free Korean Peninsula within the framework of the Six-Party Talks. And I will, as I told Minister Okada, never forget the families of the abducted, whom I met in Japan last February. I heard their stories, I looked at their pictures, and I carry that in my heart. Let me repeat what American officials have said ever since President Eisenhower signed our treaty 50 years ago: The commitment of the United States to Japan’s security is unwavering. To ensure that our alliance is well positioned to adapt and respond to evolving challenges, we must bolster our diplomatic engagement and security arrangements and ensure that our military posture can continue to provide the security that has been so instrumental in the region’s stability for so long. We must do this while reducing the impact on local communities by American military bases, particularly in Okinawa. Our two governments drew up the realignment roadmap with these dual goals in mind, and we look to our Japanese allies and friends to follow through on their commitments, including on Futenma. So Minister Okada, this was a long and comprehensive meeting with a very substantive, serious agenda. We have much work to do together, but I’m confident that our alliance is up to the task, just as it has been for the last 50 years. Thank you. FOREIGN MINISTER OKADA: (Via interpreter) Thank you. Let me – under this strong sunlight of Hawaii, I feel like staying one more day and take a little bit of rest. But over the past 80 minutes, I had a meeting with Secretary Clinton, and let me discuss that. This is the third time that I meet with Secretary Clinton in the setting of bilateral foreign ministers meeting since our first meeting in September at the UN General Assembly. And I think we had a very good meeting. We look forward to meeting as frequently as possible to discuss Japan-U.S. alliance and other matters as well. With regard to U.S. alliance, it is important for its own security and for the peace and stability of the Asia-Pacific. 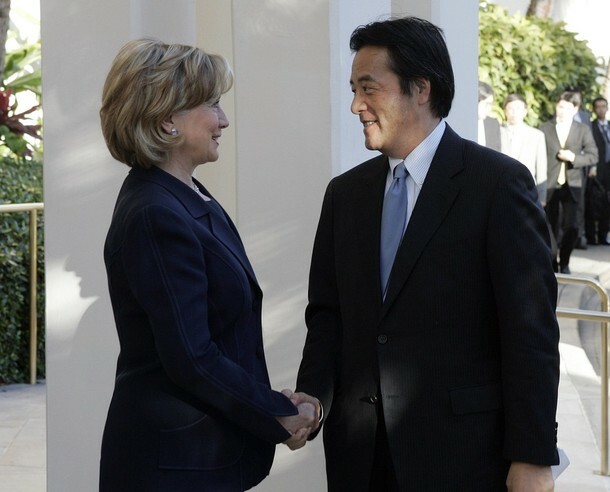 That is my awareness and is the perception of Prime Minister Hatoyama as well, and I conveyed that message to Secretary Clinton. And this is what I also said at our first meeting in September as well – that we must make the Japan-U.S. alliance sustainable for the next 30 or 50 years, and further deepen this alliance. And we would like to make efforts to that end mutually. One week from now, we’ll be marking the 50th anniversary of the signing of the Japan-U.S. Security Treaty. And on that memorable day, we would like to launch consultations for the purpose of further deepening that alliance. And we confirmed that, and I think in fact we have marked our first step towards that, and for the security of Japan and to further bolster the Japan-U.S. alliance that is functioning for Japan’s own security, as well as for the peace and stability of the Asia-Pacific region. Apart from the Japan-U.S. alliance, we also discussed more global issues. As the Secretary just mentioned, we discussed Afghanistan, Iran, North Korea, and also global warming, nuclear nonproliferation and disarmament, Myanmar, et cetera. 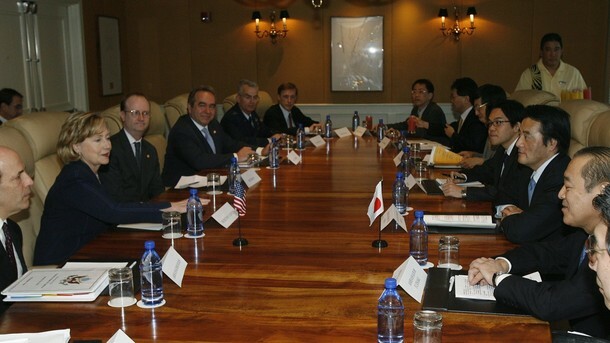 I’m not going to delve into details, I believe, but the mere fact that these diverse issues came up in our discussions I think is a testament to the importance of our Japan-U.S. alliance, and that it is meaningful under this alliance for our two countries to discuss these various issues. I’ll maybe go into further details if there are questions, but basically, we’ve been able to share our awareness, recognition, and we also confirmed the importance of further stepping up our cooperation. So, that’s all for me. Thank you. MODERATOR: The first question is from Bob Burns from the AP. QUESTION: Madame Secretary, good morning. QUESTION: You mentioned in your opening remarks that you were looking for Japan to follow through on its commitments, in particular on Futenma. I’m wondering, in your talks today, did you receive specific explicit assurance that Futenma would not be actually forced off of Okinawa entirely? Were you given any commitments about timing of a decision? And more broadly, are you reassured that the new Japanese Government is fully committed to the security side of the alliance? 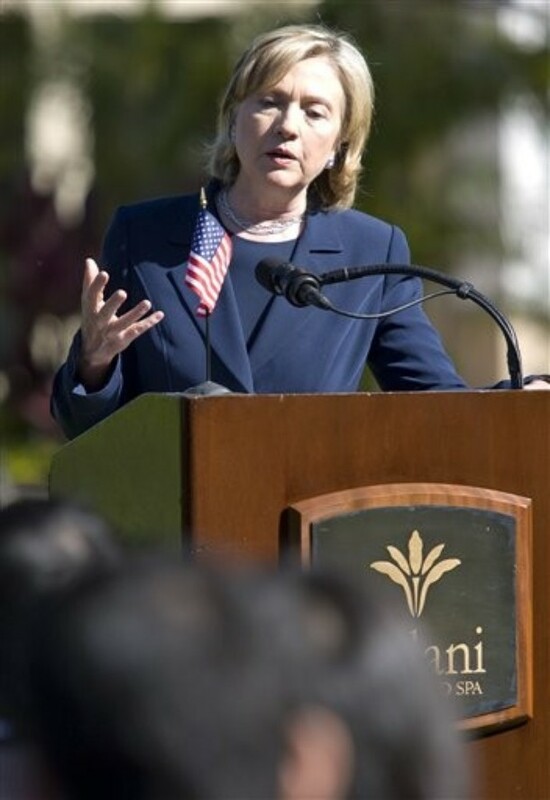 SECRETARY CLINTON: Well, Bob, as we celebrate the 50th anniversary of our alliance, security is at the heart of it. And in my conversations, not only today but going back to our very first one in September with the foreign minister, I know that Japan understands and agrees that our security alliance is fundamental to the future of Japan and the region, as well as the common interests that we have in stability, prosperity, and a better future. I have stressed again today, as I have in previous meetings, that it is important to move on Futenma. The Japanese Government has explained the process that they are pursuing to reach a resolution of the issues that they are working through, and we respect that. We remain of the opinion that the realignment roadmap is the way forward. It is an agreement that was reached between prior governments of each of our countries, but it reflects a lot of serious thought and analysis by our respective militaries as well as others – other aspects of each of our governments. But I think, as both the minister and I said, we have lots of other business to conduct. This is an issue that we view as very important, but it is part of our comprehensive partnership, and it is one that we pay great attention to. But we also are working on so many other aspects of the global challenges that we face, and we’re going to continue to do that. QUESTION: So you did not receive any explicit commitment that it would not be eventually forced off of Okinawa? 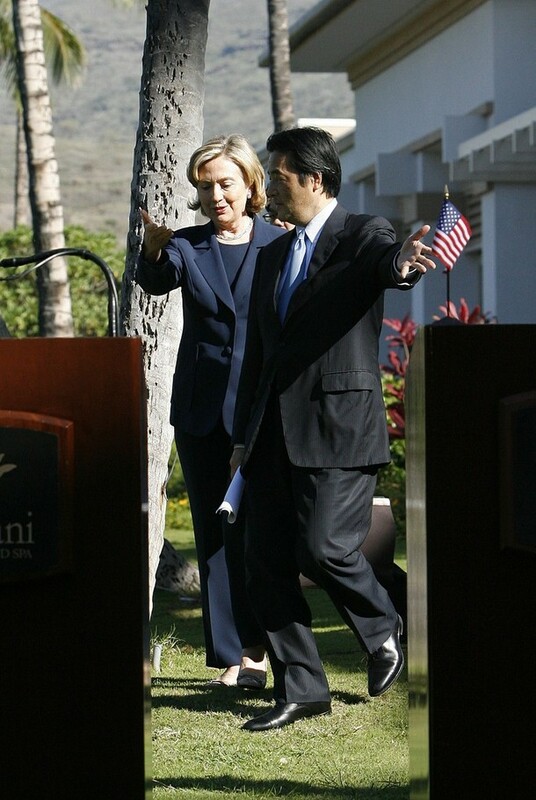 SECRETARY CLINTON: We are respectful of the process that the Japanese Government is going through. They understand very well our position that we want to see the realignment roadmap carried through on. But we also have an appreciation for some of the difficult issues that this new government must address. At the end of the day, I am confident that we will resolve this matter in a way that reflects the very best of our alliance, the strength of that alliance for the next 50 years, and provides the security guarantees that the Japanese people are looking for. QUESTION: (Via interpreter) I’m from NHK. A question for Foreign Minister Okada, please. As was stated in your remarks by both of you, you’ll be launching bilateral consultations to strengthen the alliance, but I wonder if you really can have substantive talks while the Futenma issue remains unresolved. What do you think is necessary to – for the Japanese Government to make the talks more than just formality? FOREIGN MINISTER OKADA: (Via interpreter) The Futenma issue – resolving that issue certainly is very important. 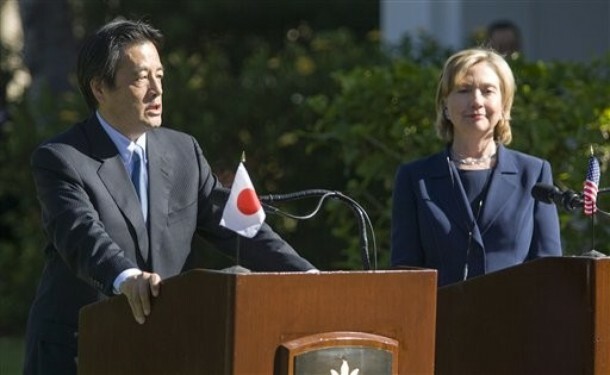 What I explained to Secretary Clinton today is that the already existing – the importance of the existing Japan-U.S. agreement, and we fully are aware of that. But we now have a change in government in Japan and there are different views within the coalition government. And against that backdrop, we have a set of timeline of May and that within the coalition government we are working on studying this replacement site. 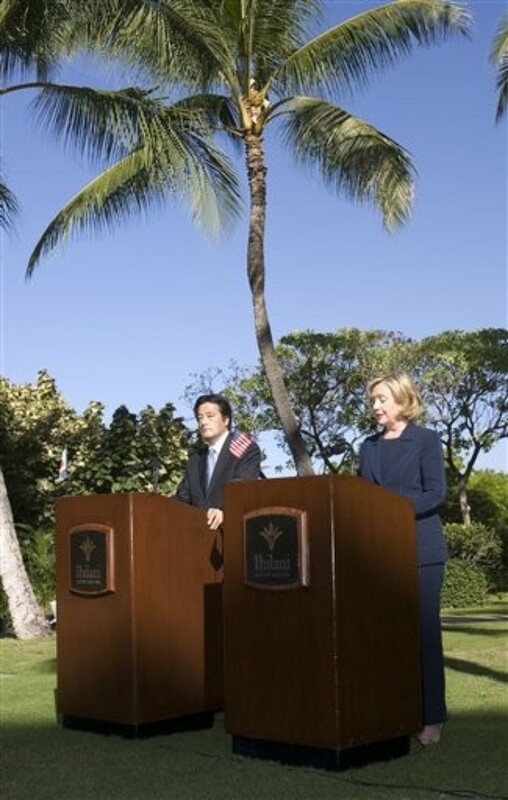 We will come up with a conclusion by May, so that there will be a minimum impact on the Japan-U.S. alliance. To the extent that – and I don’t think it is right to say that we cannot engage in other discussions because of the Futenma issue on Japan-U.S. alliance. First, we have to recognize the current status of that alliance or we have to analyze the situation in East Asia, in the Asia Pacific region, the existing security environment. We first have to share the perception about that current status and engage in further discussions between our two countries, so that at the end of the day, between our two countries, we’ll be able to further deepen our alliance and come up with a conclusion through the talks. MODERATOR: The next question is from Mark Landler of The New York Times. QUESTION: Good morning, Madame Secretary. Good morning, Minister Okada. A question first for Madame Secretary. China announced late on Monday that it had successfully conducted a test of a land-based missile defense system. It’s being widely perceived as a symbol or an expression of Chinese unhappiness about arms sales to Taiwan. Are you – could you, first of all, give me a reaction to that missile test, whether you have a response? And secondly, are you concerned that indeed we are seeing a series of steps that could foretell a bumpier relationship with China? And then to the minister, as China is such a close neighbor of yours, I’d be interested whether you have a reaction to the missile test. SECRETARY CLINTON: Well, Mark, we are in the process of gathering information and analyzing the test, so I do not want to prematurely express any opinion about it. I do think it is not connected to any other action or event. We have followed the Chinese development of aerospace capacity for quite some time and this had been foreshadowed some weeks ago. As I said yesterday, we have invested over the past year in developing a positive, cooperative, and comprehensive relationship with China. We believe there are many issues on which we have common views. There are obviously with any two nations, like any two people, some where we have differences of opinion, but the relationship is on a firm foundation and we will be able to engage in open consultation and conversation with the Chinese. And we’ll have more to say about the specific test when we have some factual information on which to base an opinion. FOREIGN MINISTER OKADA: (Via interpreter) I would say that we are not aware of the details and therefore I’ll refrain from commenting on that at this stage. For Japan, China economically and politically is a very important country, and we very much hope that China will be engaged further in the international community. And to that end, Japan and the United States, I believe, should cooperate with each other. I think that will be very important. QUESTION: (Via interpreter) This is (inaudible) with Jiji Press. 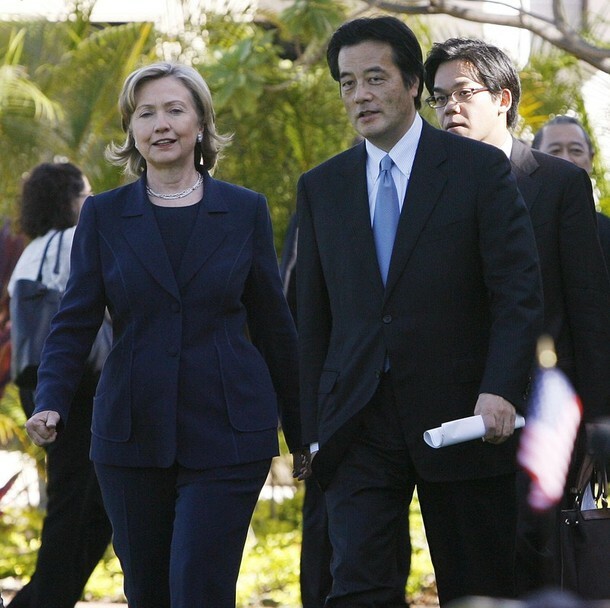 A question for Secretary Clinton on Futenma. The Japanese coalition government has started studying a possible new site for replacement. And what impact would there be on Japan-U.S. relations if the Japanese coalition study group on Futenma relocation decided on a site other than Hanako that was agreed between U.S. and Japan, and will U.S. engage in negotiations over that site? SECRETARY CLINTON: Well, I don’t want to answer a hypothetical question. We know that there is a lot of concern, as Minister Okada said, within the new coalition. The Japanese Government is working to respond to those concerns and obviously examining the decisions that were made by prior governments. Our position remains that in terms of both the security arrangements needed to protect Japan and to limit the impact of bases on local communities, particularly on Okinawa, that the realignment roadmap presents the best way forward. But as Minister Okada said, we are going to be meeting, we’re going to be consulting, we’re going to be asking experts for their advice. And we want to get a decision by May because much of the rest of the work around the realignment roadmap has already proceeded. The United States has already made decisions based on that roadmap, which was accepted by prior governments. So we want to work closely with our alliance partner and reach the best outcome for Japan and the United States. And as I have said several times already, we think that the realignment roadmap provides the best way forward. In a study released by the International Journal of Biological Sciences, analyzing the effects of genetically modified foods on mammalian health, researchers found that agricultural giant Monsanto’s GMO corn is linked to organ damage in rats…. Duke Aiona today announced five county chairs and co-chairs and 13 regional chairs for his growing campaign. The leadership team will provide grassroots support to mobilize and turn out voters for Duke Aiona in the 2010 gubernatorial election. The grassroots leadership team comprises a broad cross-section of supporters representative of Hawai‘i’s diverse population. Aiona’s chairs will help to formulate and implement grassroots strategy and support his vision to improve education, strengthen the economy and create jobs. More information about the Duke Aiona for Governor campaign can be found on DukeAiona.com. Residents can also contact one of several island-specific email addresses. Among them: Hawaii@DukeAiona.com, Maui@DukeAiona.com, Molokai@DukeAiona.com, Lanai@DukeAiona.com, Kauai@DukeAiona.com, and Oahu@DukeAiona.com. Mahalo to the U.S. Pacific Command Facebook site for the heads up.